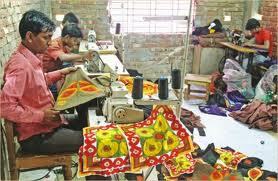 Dhaka, Bangladesh (BBN) – The overall small and medium enterprise (SME) credit disbursement grew by more than 22 percent in 2013 for close monitoring and supervision by the central bank. All banks and non-banking financial institutions (NBFIs) disbursed BDT 853.23 billion to 744228 SME entrepreneurs across the country in 2013, which was 116 percent higher than the target of BDT 741.87 billion. “We’ve crossed our SME loan disbursement target in the last calendar year despite political turmoil,” Masum Patwary, general manager of the SME and Special Programmes Department of the Bangladesh Bank (BB), told BBN in Dhaka. The loans were given to more than 130 SME sub sectors such as light engineering, handicraft, flower, fish processing, handloom, rice mills, jamdani, Rajshahi silk, khadi, bio-gas and compost fertiliser. The central banker also said the BB has taken different measures including introducing a new monitoring system using mobile phone to ensure proper utilisation of the SME loans across the country. Besides, the central bank has introduced a three-tier monitoring system to ensure growth of the SME sector in the country, he added. Under the monitoring system, the central bank headquarters, its ten branch offices across the country and head offices of all commercial banks will review the implementation of SME credit programmes regularly. The central bank has already set the SME credit disbursement target at BDT 887.53 billion for the current calendar year, marking nearly 20 percent growth over that of the previous year. However, credit growth in the manufacturing sector under the SME programme decreased slightly in the last calendar year due mainly to the political uncertainty. The credit growth in manufacturing sector came down to 28.15 percent in 2013 from 31.39 percent a year ago, according to the central bank statistics. Service sector credit growth rose to 5.40 percent in 2013 from 5.21 percent in 2012 while credit growth in the trading sector reached 66.45 percent from 63.40 percent.